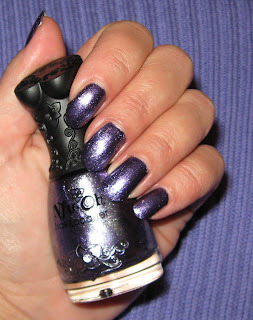 Nfu-Oh #68 is a lovely dark violet or medium purple with a bit of a metallic look to it. Two coats is all you need and it applies neatly without streaks. In the bottle you can see very fine silver shimmer, but unlike some of the NFU's it does not reflect any color other than the purple. Before I removed it I topped it with #46 which is considered one of the flaky colors, although this one has a heavier base color than many of the other flakies. I've worn it alone and it's a really nice true red with plenty of sparkle. Don't forget to e-mail me your entry for the St. Patty's Day contest which ends at midnight tomorrow! E-mail your beauty tips (see side bar titled 'Tip Jar') this month for the April 1 drawing! Send all entries to mej0620@hotmail.com. I'll announce what the prize is sometime this coming week.